Sally Weekes and the Handicap team have completed the annual review of handicaps. A list of revised handicaps and ladies who need to play more qualifying competitions to keep their handicaps current, are displayed on the Ladies Handicap Notice Board. Please check whether your name is on this list. 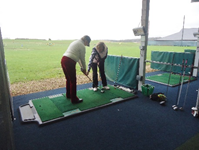 Congratulations to all the golfers who have had their handicaps cut from 1st March: Pam Blake, Megan Bonner, Lesley Bonser, Linda Brown, Kathy Carroll, Susanna Chan, Angela Chatterton, Jodie Lusby, Kathy Morris, Sue Oliva, Jean Ray, Chris Skeen, Rogie Taylor, Patti Vincent. Also a list of players who have not yet played 5 qualifying competitions to be eligible to play in the Ladies Club Championship on 23rd and 30th June is displayed on the sign up notice board. There are still 8 weekend qualifiers and 10 midweek qualifiers to play in, so you have plenty of opportunity to make sure you have played sufficient competitions to enter. Some ladies are practicing hard at Jo’s weekly clinic. Practice makes perfect !!! Saturday 23rd January – This week LESLEY BONSER won 1st place in the Weekend Mixed competition. With a brilliant 43 stableford points, Lesley beat 86 men/lady golfers to win on countback. Congratulations!! A fantastic achievement. An exceptionally windy day – it quite took some players’ breath away. But with just 5 clubs and a putter (who needs all 14 clubs?!!) some very creditable scores were achieved. Round 4 of the Winter Stableford this week. Equal 1st Marica Kelland and Margaret Fredjohn scored excellent 18 points. Equal 2nd Jean Ray and Rogie Taylor both scored 17 points. Lin Goodey and Rogie Taylor are monitoring all our scorecards – still 3 more rounds to go. All the up to date scores are available to view on the Chesfield Downs ladies website – Thank you Virginia for your help with these.